In 1989, the Yoga school at 3 Alpenstrasse in Bern was founded and since then enjoys great popularity. In our rooms we understand Yoga as an attitude, lifestyle and a lived philosophy. We practice Asana, the practice of yoga positions. Our yoga classes are based on the needs and capabilities of the people. The foreground in this type of yoga practice is the function of the organs and the flexibility of joints and vertebral column. Nerves, muscles, ligaments, organs and joints are to be brought into balance. Yoga practice has to harmonize body, mind and soul. That's why our yoga instructors practice the form of the Asanas (postures). In total, there is a large number of single exercises, that have different variations and preliminary exercises. Asanas are suitable for the harmony of the body, because they are supposed to perform two qualities including: On the one hand, stability and on the other hand, well-being. 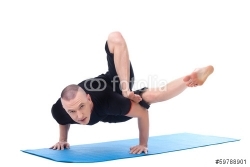 During the Asanas, it is very important the exercises to be brought in deliberately. Conscious breathing, conscious keeping and conscious releasing of the posture are the basic techniques, which should be respected, therefore should always be present a yoga instructor. Over the centuries was created a great quantity of Asanas, that have a positive impact on mental and physical health. Each and every singe posture creates some space where the flow of life can flow. In this way, blocks can be removed, harmonisation created and new energy released. In spite of this, not the success, but the experience of spiritual quality is the focus. Asana tries to calm down the flow of thoughts and to make you experience your own centre - without burdening thoughts. Therefore, during practice, it is only the most essential things spoken and it is recommended to close your eyes so that you could focus on yourself, because in daily life our thoughts are constantly in motion and don't come down. The Asanas are used for composure and centering of our entire being, in order to achieve a certain lightness and stability in us. Meditation was developed over the centuries in many parts of the world. Every culture has its own form. From the vantage point of the present, meditation is definitely helpful to reduce stress and to relax. There are several different types to practice Asanas, all have one thing in common: The positive effects have been demonstrated in medical studies. Mobility and coordination are stimulated, the positive effect of hormonal balance and blood circulation, or the strengthening of the immune system are described as outstanding effects of the exercises. Yoga consists of many individual parts that result in a healthy picture. Our vision is to bring these parts closer to the people and so, to make possible to live in peace with their own environment. Even through a yoga lesson a week, the positive effects of the exercises can be experienced. If you practice regularly, you will experiece further effects on your body and life.